First on the field, then as trade fodder, Charlie Babb played a useful part in the events that catapulted the turn-of-the-century New York Giants from worst to first in National League standings. In remaking the roster of the 1902 cellar dwellers, recently-installed Giants manager John McGraw envisioned the shortstop position being manned by George Davis, the future Hall of Famer whom McGraw had induced to jump his contract with the Chicago White Sox. But when league-office directives and a federal court injunction sidelined Davis for virtually the entire 1903 season, Babb, an unheralded rookie, proved a surprisingly competent replacement, helping the Giants soar to a second-place finish. Then in the offseason, the trade of Babb (and second-tier Giants pitcher Jack Cronin, plus cash) yielded McGraw the next best thing to Davis: Brooklyn’s Bill Dahlen, the best defensive shortstop in baseball. With Dahlen anchoring the Giants infield, New York went on to capture the NL pennant in 1904, and a World Series title the following year. Unhappily for Charlie Babb, World Series celebrations in the Giants locker room roughly coincided with his departure from major-league baseball, his three-season tour of duty completed. Released by Brooklyn late in the 1905 campaign, he thereafter signed with Memphis of the Southern Association and spent the remainder of his career as a player-manager at various minor-league outposts. Babb left the game at the end of 1913, and spent the rest of his life living and working out of the limelight. He died quietly in his sleep at age 81. Babb made his professional debut as the third baseman of the Portland Gladiators, the club piloted by ex-major leaguer and circuit organizer Bob Glenalvin. Even before a game had been played, a Sporting Life correspondent was predicting success for Babb. “It will not be more than one season before Charles Babb, our young third baseman, is found in the major ranks,” predicted the writer, who went by the pseudonym Consolidation, “for if ever there was a ballplayer destined to become a league man, it is this young fellow Babb. Quick on his feet, a perfect fielder, and a way above average hitter, everything points to his rapid advance in the baseball profession. We are all proud of Charley and see in him the making of the greatest third base player of the age.”7 Once the season started, Babb’s play seemed to vindicate the testimonial. In 29 games, he batted .321, with 13 extra-base hits and 12 stolen bases while playing excellent defense for the first-place Gladiators. The New Pacific League as a whole, however, did not fare well. With its other three clubs playing sub-.500 ball, the league disbanded on June 15, leaving Babb and his teammates at loose ends. Babb encored for Fort Wayne in 1898, batting .317 with 36 extra-base hits and 20 stolen bases in 151 games played. His reward: another chance in the Western League, being a postseason draft choice of the Indianapolis Hoosiers.18 But a far more significant event in the life of Charlie Babb occurred that year off the diamond. On October 20, 1898, he married 18-year-old Kansas native Agnes McCormack. Their 55-year-union would be a happy one but marred, sadly, by the loss of their only child, a belatedly-arrived infant daughter named Anna in 1911. For the next two seasons, Babb remained stuck in Fort Wayne,23 playing capably (with .285 and .308 batting averages in 1900-1901), but his prospects for advancement to the major leagues were growing ever dimmer. Back in Indianapolis for the 1902 campaign, Babb took matters into his own hands at midseason. With Indianapolis now a member of the newly created American Association, an independent (or outlaw) minor league unprotected by the National Agreement, Babb jumped to the Memphis Egyptians of the Class B Southern Association.24 The Babb signing was one of several controversial personnel moves by Memphis that soon roiled the circuit in internal discord, and on several occasions Babb was barred from entering the playing grounds of a league rival.25 When he was able to play, Babb performed ably, batting .284 in 66 games for the Egyptians. The timing of the Pulliam edict left McGraw few options beyond using untested Charlie Babb as his Opening Day shortstop. On April 17, 1903, the 30-year-old rookie made his major-league debut against Brooklyn before some 20,000 Polo Grounds spectators. With staff ace Christy Mathewson turning in an uncharacteristically poor outing, the Giants lost, 9-7. But despite making one of New York’s six fielding errors, Babb had a pretty good day. In five plate appearances against Superbas right-hander Henry Schmidt, he singled twice, successfully sacrificed, and scored a run. With the tying runs on base in the ninth, however, Babb struck out. Still, McGraw was satisfied with what he saw, and Babb remained the Giants everyday shortstop into early July. While Babb was manning his position, the strong-willed Davis refused to report to Chicago, spending most of his afternoons in a Polo Grounds box seat or at local race tracks. Thus, Davis was in town and available to play when events involving New York Highlanders shortstop Kid Elberfeld prompted NL President Pulliam to grant New York club owner Brush’s petition to reinstate Davis to the Giants roster. McGraw immediately reinserted Davis into the lineup, but the three months of idleness had left the veteran in no condition to perform to previous standards. Davis played poorly in four road games, but a federal court injunction secured by White Sox owner Comiskey relieved McGraw of the duty of sending Davis to the bench. With Davis now legally enjoined from playing anywhere other than Chicago, Babb resumed playing shortstop for the Giants. Babb finished the 1903 season with decent numbers in 121 games played. At bat, he posted a Deadball Era-respectable .248 batting average. He hit with little power (only 23 extra-base hits), but being hit-by-pitch a league-leading 22 times boosted his on-base percentage to an above-average .350. On the minus side, Babb also led the NL in strikeouts (64). In the field, he was less than graceful but managed to post middle-of-the-pack defensive stats for a National League shortstop. All things considered, Babb had had a successful maiden season, establishing himself as a bona-fide major-league ballplayer in the process. Both men fulfilled expectations during the 1904 season. Dahlen had an outstanding year, leading the National League in RBIs (80) while playing a sterling game at shortstop for the pennant-winning (106-47) New York Giants. But Babb played well, too. In 151 games at short for a sixth-place (56-97) Brooklyn club, he led the NL in putouts (370) and posted a solid-for-the-era .927 fielding average. On offense, he raised his batting average to .265 and stole 34 bases. Based on that performance, an extended stay in the majors seemed assured. Regrettably, it was not to be. Babb got off to a poor start in 1905 and was never able to recover. At the plate, it looked as if he had forgotten how to hit, given to “swing[ing] feebly at the curves which come inside the plate.”31 He finished the season batting a meager .187 in 235 at-bats. Babb had also been displaced defensively, giving way at shortstop to 21-year-old Phil Lewis, and was limited mostly to fill-in work at first and third base. On September 2 Charlie Babb played third and went 0-for-2 in a 1-0 loss to Boston. It was his last major-league game. Several days later, Babb was released by Brooklyn,32 bring his three-year stay in the bigs to a close. In 347 games played, he batted .243, with 54 extra-base hits (but no homers), and 66 stolen bases. He scored 144 runs and knocked in 116. Babb had been at shortstop for 300 of his games, posting a decent .921 fielding average at the position. Through it all, he had been a congenial teammate and was well-liked by fans and the sporting press. 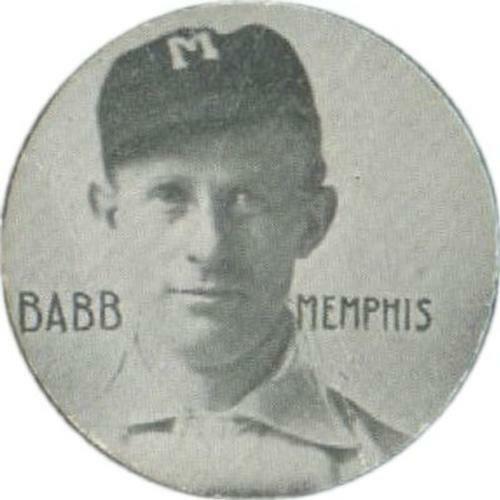 Before the year was out, Babb returned to Memphis, where he became player-manager of the local club in the now-Class A Southern Association. As was the responsibility of all minor-league skippers, it was Babb’s job to recruit the playing talent for the Egyptians’ roster, and at first he did well. In his first two seasons at the helm, he found and signed the players needed to guide Memphis to second-place finishes. Babb, moreover, led his charges by example, playing third base full-time and posting solid .294 and .270 batting averages in 1906 and 1907.33 During the latter year, Memphis had led most of the way, only to lose a late-season series to the Atlanta Crackers, and the SA crown with it. The following spring, Babb sought to retool his club. One of his personnel moves involved the sale of grizzled pitcher Otis Stocksdale to a league rival, the Mobile (Alabama) Sea Gulls. Stocksdale, a major leaguer a decade earlier,34 had been with Memphis since 1904, and wanted to remain there as he had recently bought a home in Memphis. Stocksdale informed Mobile management that he would not report, “and if he was not given a berth on the Memphis team he would ask for his release, as he did not care to play in any other city.”35 Thus were planted the seeds of the only scandal ever to envelop Charlie Babb during his baseball career. Babb continued as Memphis player-manager through the 1910 season, but both his own performance and that of his club went downhill. He finished his five-season stint as Memphis field leader with a 339-338 (.501) record. The following year he dropped down to the Class C Virginia League, managing the Norfolk Tars (67-54) to a close second-place finish. But a brief late-season stint with the St. Joseph (Missouri) Drummers of the Western League44 left him unavailable to prosecute an ineligible-player charge he had leveled at the pennant-winning Petersburg club, and probably occasioned his discharge from Virginia League ranks.45 A 1912 job offer from the Syracuse Stars of the Class B New York State League was rescinded when the sale of the club fell through, prompting Babb to file a grievance seeking damages and unpaid salary with the National Association of Professional Base Ball Leagues, the overseer of minor league ball. A small award in Babb’s favor was granted by the NAPBBL, and upheld on appeal by the National Commission when Babb appealed seeking more money.46 Babb then spent the season as player-manager of the Altoona Rams/Reading Pretzels of the Pennsylvania-based Class B Tri-State League, guiding the club to a sixth-place (62-59) finish while batting .283 in 75 games. Babb’s final season in Organized Baseball was spent back in the Western League with brief, unsuccessful stints in charge of the Wichita Jobbers and Omaha Rourkes. In early September he was released by Omaha “for the purpose of reducing club expenses as [club boss Pa] Rourke found no fault in his work.”47 The dismissal brought to a close a productive and honorable 18-season career in the professional baseball. In February 1914 Charlie Babb officially retired from the game to become the proprietor of a Memphis grocery store.48 By September 1918 he was working as a presser for a Memphis clothes-cleaning establishment.49 Babb and his wife, Agnes, remained Memphis residents for the next two decades, with Charlie reconnecting with his old hometown via a harrowing tale about a chicken defending her brood from a predatory rat written for the animal stories section of the (Portland) Oregonian.50 In September 1941 the Babbs returned to Portland51 where they lived quietly the rest of their lives. On the morning of March 19, 1954, Charles Amos Babb was discovered dead in his bed, the victim of an overnight heart attack.52 He was 81. Following services at a local mortuary, his remains were cremated. Later, the family buried his ashes in the Babb family plot in Lone Fir Cemetery, Portland.53 The lone immediate survivor was his wife of 55 years, Agnes McCormack Babb. Sources for the biographical detail provided herein include the circa 1962 player questionnaire completed for Charlie Babb by his widow; US Census, Portland City Directory, and Babb family post data accessed via Ancestry.com; and certain of the newspaper articles cited below. Unless otherwise noted, stats have been taken from Baseball-Reference. 1 His younger sister was Emma May Babb (later Streyffeler, 1876-1943). Six years after mother Ellen Babb’s death, the remarriage of their father to widow Anna Mattison provided Charlie and Emma with seven adult half-siblings. 2 As per the Portland City Directory, 1892-1893. 3 As reported in the (Portland) Oregonian, May 30, 1893. 4 As per the Oregonian, December 3, 1894. Babb was also a substitute on the PAAC football team. 5 Beginning with the four-team California League of 1888, there was sporadic recognized league play on the West Coast, but none since another version of the California League had folded at the conclusion of the 1893 season. 6 As reported in the Oregonian, December 2, 1895. According to various sources, Babb initially wanted to join St. Paul but was persuaded that it would be more prudent to make his professional debut before more forgiving local fans. See Sporting Life, November 16, 1895, and the Oregonian, December 16, 1895. 7 Sporting Life, April 25, 1896. 8 The circa 1962 player questionnaire completed by Agnes McCormack Babb for her late husband of 55 years specified that he batted “both,” and since that time baseball reference works have identified Charlie Babb as a switch-hitter. But no contemporaneous mention of Babb being a switch-hitting batter, still relatively rare at the turn of the century and therefore press-noteworthy, was encountered by the writer. Rather, the only discovered historical mention of his batting style stated that “Babb is a left-handed batter.” See Sporting Life, February 11, 1899. 9 As reported in the Wheeling (West Virginia) Register, July 1, 1896, and Sporting Life, July 4, 1896. 10 Babb also got two base hits in his Wheeling debut, a 2-1 victory over the Washington (Pennsylvania) Little Senators on July 2. 11 As reported in the Cleveland Plain Dealer, July 26, 1896, and Sporting Life, August 2, 1896. 12 As reported in the Wheeling Register, July 27, 1896. 13 Baseball-Reference includes the New Castle (Pennsylvania) Quakers on Babb’s 1896 Interstate League itinerary, as well, but the writer found no evidence of his engagement by that club. 14 As per official 1896 Interstate League statistics published in Sporting Life, February 6, 1897. Baseball-Reference provides no 1896 ISL numbers for Babb. 15 As reported in Sporting Life, April 8, 1897, and the Cleveland Plain Dealer, April 14, 1897. 16 As per Sporting Life, May 8 and 15, 1897. 17 As per season-ending Interstate League stats published in the Cleveland Leader, October 11, 1897. Baseball-Reference has only partial stats for Babb’s 1897 season. Babb was one of 31 ISL batsmen to average over .300 in the offensive-minded league, with the batting crown taken by the .411 BA of Bill Myers of Toledo. 18 As reported in Sporting Life, February 11, 1898. 19 Mark Well, “Hoosiers Happy,” Sporting Life, February 11, 1899. 20 Mark Well, Sporting Life, March 11, 1899. 21 Sporting Life, May 27, 1899. According to Mark Well, Babb’s prospects in Indianapolis had been undermined by bad-mouthing from a former employer, Columbus club boss George Tebeau. See Sporting Life, April 15, 1899. 22 As per the 1900 Reach Baseball Guide, 77. Baseball-Reference has no 1899 stats for Babb. 23 When the Interstate League disbanded shortly before the 1901 season commenced, Fort Wayne became a member of the Class A Western Association. 24 As reported in the Fort Worth Morning Register, June 25, 1902, the Montgomery (Alabama) Advertiser and New Orleans Item, June 26, 1902, and elsewhere. Prior to his departure, Babb had appeared in 50 games for Indianapolis, batting .298. 25 For a more detailed exposition of the Babb situation, see Thom Karmik, “Baseball Will Be in Utter Disrepute,” Baseball History Daily, posted online September 18, 2013. 26 As reported in the Washington Evening Star, December 6, 1902, and Baltimore Sun and Boston Herald, December 7, 1902. Years later, the Memphis club filed an unsuccessful grievance with the National Commission, claiming that Brush should have paid Memphis the $750 for Babb’s release, rather than Indianapolis. See the Washington Evening Star, February 14, 1906. 27 For a fuller explanation of the complicated Davis situation, see the writer’s “The Ward v. Johnson Libel Case: The Last Battle of the Great Baseball War,” Base Ball: A Journal of the Early Game, Vol. 2, No. 2 (Fall 2008), 50-52. 28 See, e.g., “McGraw Made Excellent Move,” Wilkes-Barre (Pennsylvania) Times, December 29, 1903. 29 John J. McGraw, My Thirty Years in Baseball (New York: Boni & Liveright, 1923), 135-136. 30 See “Brooklyn Bulletin,” Sporting Life, December 26, 1903. Foster and others mistook the 30-year-old Babb for a much younger man. 31 Sporting Life, June 3, 1905. 32 As reported in Sporting Life, September 9, 1905. 33 In 1906 Babb led the Southern Association in base hits (160) and home runs (5), according to The Encyclopedia of Minor League Baseball, Lloyd Johnson and Miles Wolff, eds. (Durham, North Carolina: Baseball America, Inc., 2d ed., 1997), 149. 34 Stocksdale had accumulated a 15-31 record pitching for three National League clubs in the mid-1890s. 35 The (Columbia, South Carolina) State, May 12, 1908. 36 As per the New Orleans Times-Picayune, June 3, 1908. See also the (Little Rock) Arkansas Gazette, June 4, 1908, and Sporting Life, June 6, 1908. 37 New Orleans Times-Picayune, June 3, 1908. 38 New Orleans Times-Picayune, June 4, 1908. Note: Contemporary news accounts of the affair invariably spelled the accuser’s name Stockdale rather than the Stocksdale that appears in modern baseball reference works. 40 See Sporting Life, June 13, 1908, and the Arkansas Gazette, June 15, 1908. 41 Sporting Life, June 27, 1908. 43 See the New Orleans Times-Picayune, June 19, 1908, and Sporting Life, June 27, 1908. The following February, the league reinstated a contrite Stocksdale, who apologized to Babb “about his naughty talk about throwing games.” The State, February 25, 1909. See also Sporting Life, March 13, 1909. 44 Babb batted .303 in 126 games for Norfolk, and .294 in 12 contests for St. Joseph. 45 According to the Washington Evening Star, January 28, 1912, and Canton (Ohio) Repository, March 16, 1912. 46 As reported in the Dallas Morning News and New York Times, April 3, 1912. 47 As per the Omaha World-Herald, September 10, 1913. 48 As reported in the New Orleans Item, February 1, 1914. See also the Washington Evening Star, February 26, 1914. 49 The National Cleaning Company was the name of the local employer given to military draft board officials. 50 See “Mother Cluck Kills Intruding Rat,” by Charles Babb of Memphis, Oregonian, August 28, 1932. 51 As reported in the Oregonian, September 16, 1941. 52 As reported in the Arkansas Gazette and Rockford (Illinois) Morning Star, March 21, 1954, and The Sporting News, March 31, 1954. 53 Per the Find-A-Grave website. Baseball-Reference and Retrosheet currently misidentify the Babb burial place as Portland Memorial Cemetery. No such cemetery exists, but Portland Memorial was the name of the cremation service used by the Babb family. Efforts to correct the Babb burial site were ongoing when this bio was submitted.